Jason Naismith (left) congratulates Joe Ward on a goal at Burton. Peterborough United players insist an FA Cup tie on an artificial pitch this Saturday (November 10) holds no terrors. Right-back Jason Naismith and captain Alex Woodyard are among those to have played many games on the sort of surface that awaits them at National League Bromley. Jason Naismith in action for Posh at Wycombe last Saturday. Naismith has experience of 4G pitches in Scottish football, while Woodyard played on plenty in his own National League days. “It’s not ideal and it will be a bit different to a normal matchday,” Naismith said. “But we wouldn’t be able to use the artificial pitch as an excuse. “I’ve played on plenty. I thought I’d got away from them as they aren’t great for the knees! “But it is what it is. We have a similar surface at the training ground and most players play on them all the time when coming through an Academy. “It’s always tricky away from home anyway, but our form on the road has been magnificent at times. “If we can keep that form going and improve at home we are bound to end up challenging for honours. Naismith seems certain to play at Bromley, but Posh boss Steve Evans could well ring the changes elsewhere after a sloppy performance in defeat at Wycombe last weekend. Striker Jason Cummings is in contention for a start after impressing and scoring in a 3-1 reserve team defeat at Rotherham this week. 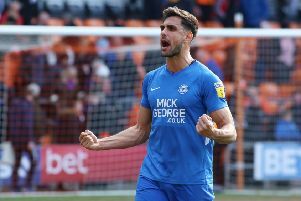 The 23 year-old on loan from Nottingham Forest started his Posh career in fine style scoring six goals in his first six appearances. But his only goal since scoring in a 5-1 League One win at Plymouth on August 25 arrived in a 2-2 Checkatrade Trophy draw with Brighton last month. “Jason looked very sharp at Rotherham,” Evans said. “He scored a high quality goal. “I have a team in mind for Bromley, but I will only confirm it after we’ve finished training on our 4G pitch this week. Some players will be better suited to an artificial surface than others. Left-back Colin Daniel, winger Marcus Maddison and attacking midfielder Jamie Walker are also in contention for a recall. Loanees Walker, Cummings and full-back Tyler Denton have all been given permission to play at Bromley by their parent clubs. Goalkeeper Conor O’Malley will also be in the matchday squad ahead of Mark Tyler.